Sydney-born John Russell was the only Australian artist to have been closely associated with some of the most original and influential artists in France at the end of the nineteenth century, namely Auguste Rodin, Claude Monet, Vincent van Gogh and Henri Matisse. Russell painted van Gogh in 1886, shortly after meeting him at Fernand Cormon's studio school in Paris, which they both attended. The portrait passed from van Gogh to his family and is now in the collection of the Vincent van Gogh Museum in Amsterdam. 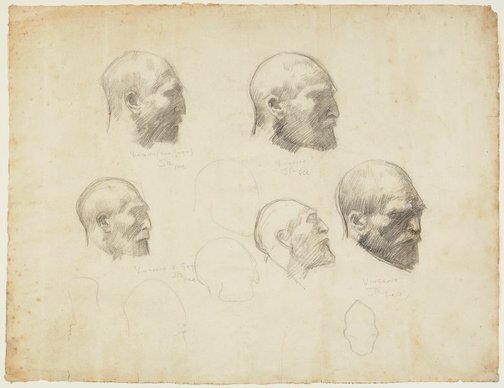 This sheet of studies appears to be from a year or so later however, possibly 1888, since van Gogh appears with a shaved head, or very closely cropped hair, as he painted himself in 1888. The year 1888 was significant for both artists – van Gogh left Paris for Arles in February and Russell married one of Rodin's young models, Marianna Mattiocco and moved into a newly built house to his own design, on Belle-Île off the coast of Brittany. Though they didn't see each other again, they did write (refer to 'The complete letters of Vincent van Gogh', Thames and Hudson, London, 1958). The paper used in this sheet of drawings has the same watermark as that for at least two of Vincent van Gogh's drawings, life studies of standing male nudes from 1885-86, except Russell's is a full sheet and van Gogh's drawings are on half sheets (refer to J-B de la Faille, 'The works of Vincent van Gogh', Weidenfeld and Nicolson, London, 1970, pg. 476, F1364-1, F1364-2). 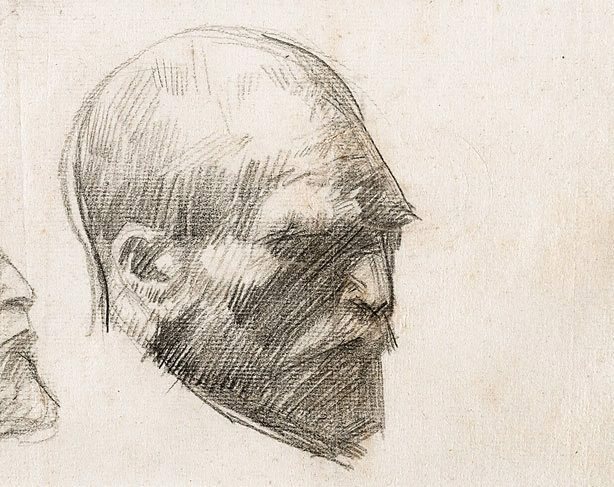 Robin and Yvonne Darwin's ownership of the sheet of drawings is interesting because it was unknown to scholars of both van Gogh's work and Russell's until relatively recently. Robin Darwin (1910-74) was Charles Darwin's great grandson and an artist in his own right. The drawing came to light when the previous owner discovered it among his mother's belongings after she died in 1999. It had been left to her by Yvonne Darwin, who died in 1985. Signed beneath each individual head study, copying pencil "JR/ FEC". Not dated. Hendrik Kolenberg, 19th century Australian watercolours, drawing and pastels from the Gallery's collection , 'Introduction', pg. 6-16, Sydney, 2005, 12, 13 (colour illus., detail), 82, 83 (colour illus.). Hendrik Kolenberg, Look , 'Drawn from life: an Australian link with Vincent Van Gogh', pg. 14-15, Sydney, Feb 2004, 14, 15 (colour illus.). Elena Taylor, Australian impressionists in France , 'John Russell and friends: Roberts, Monet, van Gogh, Matisse, Rodin', pg. 52-70, Melbourne, 2013, 56 (colour illus. ), 169, 174, 176.